A chance reading of a story in the Cambridge Evening News of an injured red kite being cared for by the Raptor Foundation (St Ives, Cambs) led to an enquiring email from me to seek permission to take photographs and make sketches of the bird for a future composition. Permission was granted, and I am most grateful to the Raptor Foundation for allowing me access whilst the bird was recuperating. 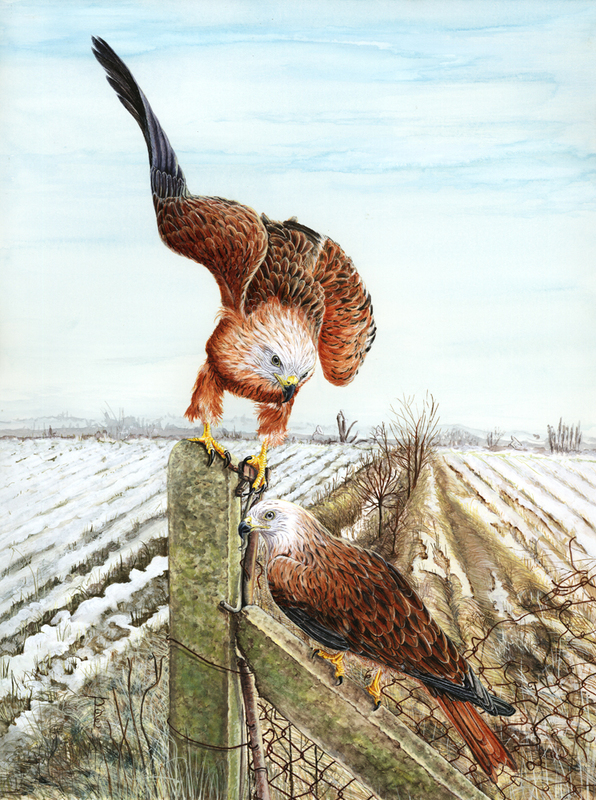 It has taken a couple of years for the painting to be completed, after, in late summer 2010, I saw a red kite flying from Eversden to Lord’s Bridge (where the telescopes are!) and on to Watt’s Wood in Comberton. Artistic license allows two birds to be present. Red kites appear to be increasing in number and flight area, and do a very good job of clearing up the ‘fallen’ in the countryside. The concrete post, and scene beyond, is taken from the south-east corner of Watt’s Wood, looking south towards the telescopes. Years have passed since such a sight!